You want to give them a Latin-English dictionary. They want a smart phone. What your tween wants is to be entertained. What you want is for them to develop their critical thinking and innovative creative skills. 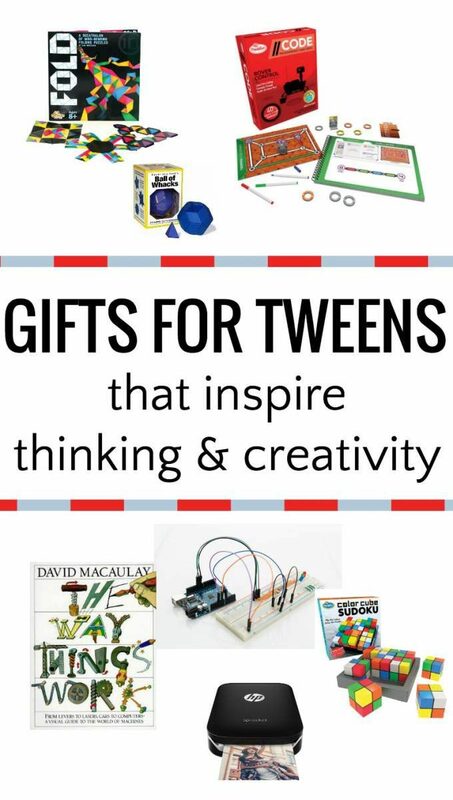 I’ll be serious here, I made this list of what I think are some of the best gifts for tweens based on what I think my tween will like. What is a tween? (Side note: I am not really a fan of this word, “tween.” But what can you do?) Depending on who you ask, it can be a child anywhere from ages 9-13. The same age as who would be reading middle grade novels. 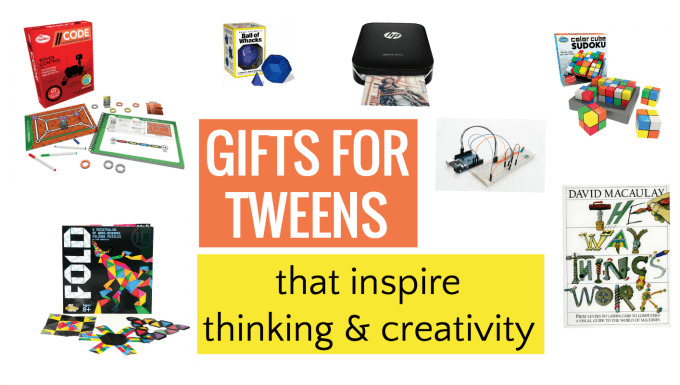 Most of the gifts on this list are appropriate for ages 8 and up. Color Cube Sudoku. Truth be told, when ThinkFun sent us this to try out, neither myself nor my 12 year old could keep away from it. The set comes with nine cubes that you must flip and arrange according to the rules of sudoku, but using colors instead of numbers. 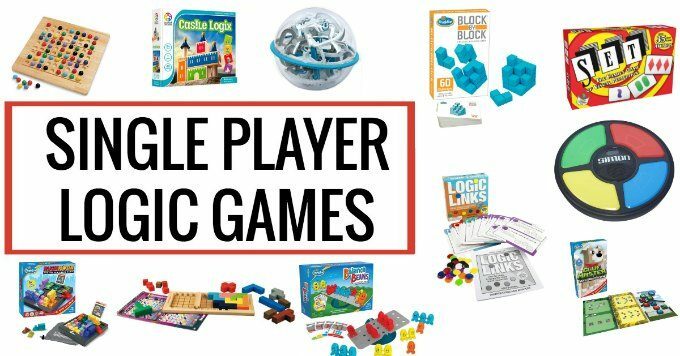 It’s great for spatial reasoning as well as building logic skills. I also love gifts like this that the parents can sneak away with when the kids aren’t looking and try it out for themselves! FOLD: Origami Brainteaser. If you’ve every tried and enjoyed a few of the brain teasers I’ve shared on the blog, your kids will adore this book! There are 10 folding puzzles that build mathematic, logical thinking and creative problem solving skills. What could be more fun? 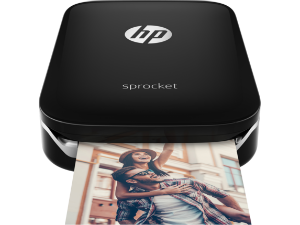 HP Sprocket Portable Printer. I LOVE THIS SO MUCH! (did the all caps convince you?) This is at the top of my list of things to get my “I don’t know what I want” tween. You put the Sprocket app on a smart phone or tablet, take your photos and then you can instantly print out the photos in this cell-phone sized printer. The reason I love it for tweens so much is that for kids who might not like to spend hours scrapbooking or who might take photos and then never do anything with them, the instant print option can be a game changer. I think it’s perfect for travel—kids can make travel journals on the go. I know my kids would never come home from a trip and then put together a journal after the fact. But throw in a little booklet he can put his instant pictures in and you’re child can make memory books instantly—think special events, class trips, etc. With the Sprocket app, kids can even personalize their photos. A special gift is the printer, a bundle of paper, a little blank journal, and maybe even a carrying case. 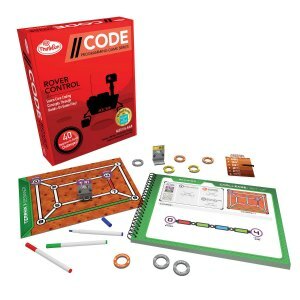 //CODE: Rover Control is a great new addition to ThinkFun’s off-screen coding games (they sent us a copy to try out). Previously I shared our love of ThinkFun’s Code Master as a Game of the Month and //CODE: Rover Control is an excellent next step. The premise of the game revolves around Mars rovers programmed to travel on colored pathways, but the paths have lost their color. Players must use critical thinking skills to determine how to color the maps so the rovers can make their way to their destinations. The game includes 40 different challenges so there are hours of play. 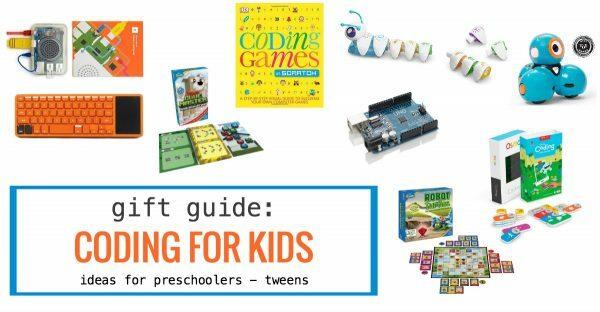 Kids will put to work the skills they need to learn for programming, all with unplugged play. Creation Crate is a monthly subscription box for kids. 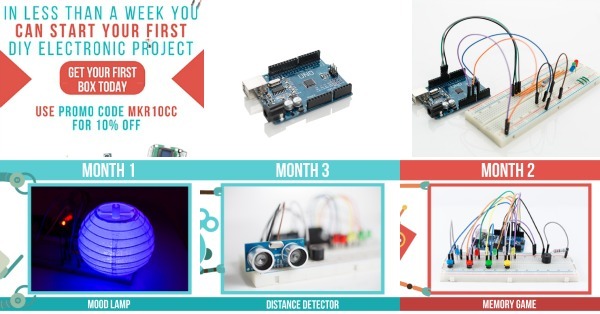 It focuses on learning and building electronics. The best part of a subscription gift is the gift continues to offer something new each month. Kids will love getting something new in the mail each month that will spark their interest. For families that are familiar with the Arduino, the Creation Crate box comes with UNO R3, which is compatible with Arudino. Each box comes with all the components and an instruction booklet to build an electronic project. The recommended age is 12 and up. My family adores subscription boxes and I’ve found that they make great family projects so if a parent is involved, kids under 12 can participate. The Way Things Work Now by David Macaulay. If you have a curious kid, this book is a winner. It may be screen-free, but Macaulay’s intricate explanation and drawings will engage even the most technologically savvy of teens. The Ball of Whacks. This is a rather amazing structure and really fun (and rather relaxing) to play around with it. There are several versions, like the star ball and the Y-ball. I love this toy because of the open-endedness of it. Tweens can set it on their desk and when they need a distraction, one of these balls is the perfect tool for getting their creative juices flowing. The balls consist of magnetized pieces that can be taken apart and interlocked in different ways for endless creative thinking! It’s my husband’s niece’s birthday today and we were stumped – we finally settled on an Amazon gift card! But when I saw the Sprocket here, I knew she’d love it. It’ll be a day late but I think she’ll be so happy! Thanks for the ideas. Love some of the others for my tween nephew for Christmas. Thanks!!! Happy to buy through your link to support all you do. I hope she loves it!! Thanks for putting this list together! Your book lists are always so fantastic but this gift list for teens is genius. I want to get everything on it. I’m bookmarking it for future reference. Awesome list! And I’m with you on the “tweens” word….makes me cringe every time!